The Macpac was Originally manufactured by Mackrill engineering but seeing an opportunity, Stewart Commercials became agents for the local Northern Ireland refuse collection vehicle market. As the relationship grew, Stewart Commercials were able to take over the exclusive rights for the design and manufacture of the Macpac in 2006, proudly bringing everything “in house” in their home town of Antrim. Focusing initially on the local public and private sectors, the product’s appeal was soon recognised by councils and various private customers across Scotland and then England and Wales. In 2013, Macpac Refuse Bodies became it’s own company having been supported by Stewart Commercials from the beginning of the Macpac story. 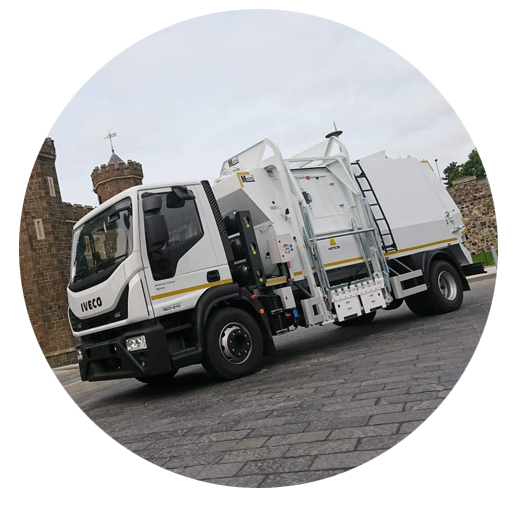 With an appetite to succeed and delivery high quality products, Macpac Refuse Bodies is now a recognised player in the refuse collection vehicle market, with customers the length and breadth of the UK. Macpac refuse bodies are used for various types of waste collection, the numerous different options allow for the collection of trade waste as well as domestic units. Versatility of the Macpac has been one of its strong points, able to be fitted to almost any commercial chassis up to 18 tonnes, it can lift wheeled containers from 120 litres to 1280 litres. The Macpac range can now be fully equipped with an on-board weighing system. As agents for Vehicle Weighing Solutions, we have been able to keep our customers safe and legal on the road, with a high-quality system that is now becoming increasingly more popular with our customers on the Macpac range. © MACPAC Refuse Bodies or as otherwise stated. All rights reserved.